Cheap recipe alert. Eggs…not just for breakfast. In a medium mixing bowl, whisk together the eggs, milk, salt and freshly ground black pepper. Arrange the bread cubes in the bottom of the prepared baking dish, then scatter the tomatoes, cheese and chopped herbs on top. Pour the milk and egg mixture over top of the breads, pressing down to submerge everything completely. Cover the dish with plastic wrap and place it in the refrigerator for at least a few hours — preferably overnight — to allow the breads to soak up all the milk. To bake, position a rack in the center of the oven and preheat to 350º F. Bake the strata uncovered until puffed and golden, and a knife inserted into its center comes out clean, about 1 hour. Let stand for 10 minutes. Cut the strata into squares and serve. Frugal Family Alert! This can be super economical! I make strata variations often. You can use spinach, parmesan cheese and tomatoes for an Italian inspired strata or olives, feta and onions for a Greek inspired one. You can also substitute and chop canned diced tomatoes into small pieces. In a large bowl, combine flour, milk, sugar, vanilla, cinnamon, nutmeg, salt and eggs. Grease a cookie sheet. Place as many slices of bread as will fit on your cookie sheet; reserve the remainder for another use. Pour milk mixture over bread pressing down bread with fork to soak in. Flip bread to other side. Cover with saran wrap and place in the fridge overnight. Preheat oven to 400 degrees. 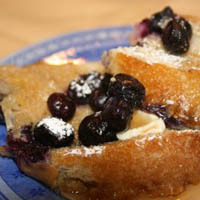 Sprinkle tops of french toast with blueberries. Bake for 25 minutes, or until nicely browned. Serve with maple syrup and powdered sugar. Frugal Family Alert! This is perfect for those day old loaves of French bread you can buy for less than a dollar at the market. Use frozen berries like I did, if fresh are too expensive. Heat oven to 350 degrees F. Cut the bread into 1/3-inch cubes. Toss with 1 tablespoon olive oil and spread in a single layer on a baking pan until golden (2-3 minutes) Fill a medium stock pot with water and bring to boil. Heat 4 tablespoons olive oil in a large skillet over medium heat. Add onions, garlic, red pepper and salt and cook until onion is brown. Remove skillet from heat and add parsely, capers, and lemon zest. 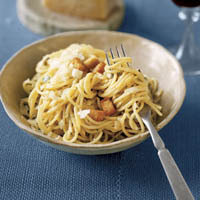 Add about 2 tablespoons salt to the boiling water, add the pasta, and cook until al dente – about 8 minutes. Drain, reserve 3 tablespoons of water. Slowly whisk the reserved pasta water into the egg yolks and remaining tablespoon of oil. Add the egg mixture and spaghetti to the skillet. Toss and combine and cook over low heat until warmed through – 1 or 2 minutes. Transfer to large serving bowl. Top with parmesan and the croutons and serve immediately. About the author: Jessica Lane is a penny pinching mama of two living on the Seacoast. She runs a blog www.barefootbysea.blogspot.com, where she discusses the trials of motherhood. Previous PostHow to be broke like a real person. Budgeting tips you can actually use. Next PostRemember these? Make your own McDonald’s copycat Fried Apple Pie.